No side effects, or drowsiness ever! Ideal for the whole family - 4 nasal beams included so you can have one each! Isn’t it frustrating when you can’t get on with your day to day tasks when you’re battling a cold? Or on those sunny days when your family want to have fun in the park and you’re unable to because the pollen count is unbearable. Did you know that in just five minutes, you can combat those sniffles, without medication? Using rhinoBeam regularly will improve your condition within three to four days, whether it is a cold, rhinitis, hay fever or similar allergies. rhinoBeam is designed with two light emitting diodes (LEDT) and works by emitting monochromatic light waves that penetrate deeply into your body tissue. These rays are natural and kind to your body as they are the same as the waves that are given off by the sun. The energy that is created by the LEDT is Adenosine TriPhosphate (ATP), this improves the function of the cells in your nasal passage. 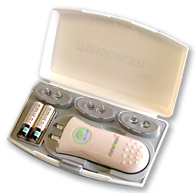 The device applies two methods that help to relieve your sniffles: light therapy and magnetic field therapy. These two methods work together to effectively treat your cold symptoms, hay fever and even snoring! rhinoBeam Forte - the natural way to combat nasal problems without the use of nasty drugs! Recent news reports have also stated that hay fever tablets raise the risk of Alzheimer's - with this revelation making front page news in the Daily Mirror and The Guardian citing popular brand names such as Nytol, Benadryl, Ditropan and Piriton among the pills studied what is a sufferer supposed to do? Thankfully help is at hand with rhinoBeam because this simple home treatment, directly targeting light to the affected area is far more beneficial than taking tablets that treat the whole body! Light Therapy really is the answer for you and your family. The LEDs transfer light energy (ATP) gently to the cells of the moist nasal lining that is referred to as ‘nasal mucosa’. The light therapy is proven to ease symptoms of hay fever and other simple allergic rhinitis. Phototherapy (or light therapy) of this kind, normalises cellular functions and slows down the formulation of histamines. The magnetic field therapy works directly on the nasal mucosa; stimulating the tissues to trigger its natural defence mechanism. It has been considered that magnetic therapy can relieve pain and reduce inflammation whilst motivating the body’s natural resistance. The device is programmed to give off 10 seconds of pulsed (15 Hz) light and then a continuous red LED light is emitted afterwards. Find yourself a comfortable place to sit or lay down and place the rhinoBeam so that the nozzles are one in each nostril. The rhinoBeam begins to work immediately and automatically switches off in five minutes. Although most people notice improvement after the first treatment, to receive the most effective results, repeat this 2 - 3 times daily and you will notice a significant difference. 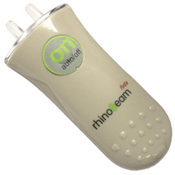 The rhinoBeam is convenient for travel; in its own travel box with 3 nasal light transmitter fittings that are suitable for adults and another one suitable for children. So you can use it whenever you or your family feel a little tickle in your nose. Enjoy the outdoors and live the nose-clear life! Light Therapy treatment for colds, hay fever, rhinitis and other nasal allergies.